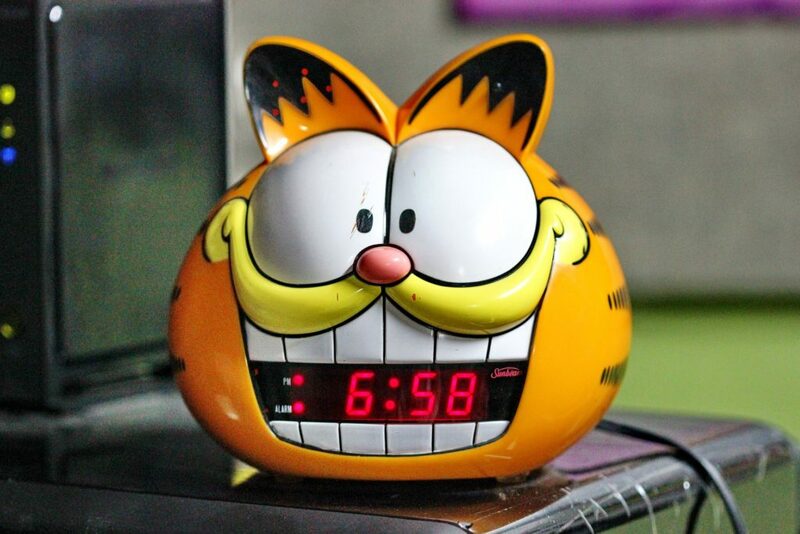 This Garfield alarm clock will give you an idea of the kind of phones mentioned in this article. (It was the closest image we could find, that was copyright-free.) Image: Pixabay. A thirty-year-old environmental mystery has finally been solved. Since the 1980s, pieces of plastic telephones that look like Garfield—the lazy cartoon cat—have been washing up on beaches in France. People living in Brittany, in the northwest of France, have picked up hundreds of pieces of the bright orange phones from beaches along the Atlantic coast. But for three decades, no one knew where the phones were coming from. On March 22, a group of volunteers from Ar Viltansoù, a coastal clean-up organization, along with two journalists from #AlertePollution, finally found out where the phones were coming from. They discovered a broken shipping container and parts of several Garfield phones inside a rocky sea cave. The cave is hard to find, and can only be reached when the tide (sea) is low. Shipping containers are used to move things like food, clothing and other items across the sea. Cargo ships carry hundreds of the huge steel containers from the countries where the goods are made or grown, to the countries where they will be sold. Nobody knows for sure how the shipping container full of Garfield phones ended up in the cave. People who live in the area say that the phones first showed up on beaches after a big storm in the early 1980s. The container probably fell off a ship during the storm, but nobody ever reported that it was missing. The Garfield phones have become a symbol of the problem of ocean pollution. Fabien Boileau is the director of Iroise Marine Natural Park, where the cave with the phones is located. He said the Garfield phones help people to understand that plastic trash doesn’t break down in the ocean. Some of the colourful plastic pieces still look almost new, even though they washed overboard more than 30 years ago. Each year, between 1,500 and 15,000 shipping containers are lost at sea when they fall off cargo ships. Some are lost during storms or accidents; others fall overboard because they aren’t fastened in place properly. These lost containers and the goods inside can have harmful and long-lasting effects on marine life and even on people who live near the ocean. About 148 million shipping containers are carried on cargo ships every year, according to the International Maritime Organization (IMO). Shipping companies do not always report containers that fall overboard. The IMO wants to create international rules that will require all cargo ships to report any lost shipping containers. The rules will also help to decide who should pay for the damage caused to the ocean by the containers and their contents. Today’s story is cute and horrific at the same time. As a result, it can be hard to describe how this story makes you feel. Chat with a friend about this story and explore different ideas and questions that you may have. Pay special attention to the questions that your friend may ask, and consider why those questions are meaningful to them. Today’s article includes several different forms of media to deepen your understanding. What forms of media help you understand content best? What are the strengths of reading, watching, listening, etc.? Many students wonder how long their paragraphs should be, and, the answer is… it doesn’t work like that. The job of a paragraph is to tell about one idea or topic. If the author chooses to tell a lot, than the paragraph is longer. If the author chooses to tell less, than that paragraph is shorter. Reread today’s article and reflect on how your understanding may be aided by the short paragraph length throughout.